On Monday, April 23, 2012, the Carolina blue sky contained just a few pure white clouds and the sun was shining at the perfect angle through a slanted wall of glass to make the most picturesque back drop for an executive sustainability conversation between USGBC President, CEO and Founding Chair Rick Fedrizzi and Duke Energy Chairman, President and CEO Jim Rogers. Since the event was open to the general public but capped at 160 to maintain intimacy, the professionals in attendance on the 46th floor vista of the Duke Energy Center (DEC) felt like they were part of the sustainability conversation. Topics ranged from the power of public-private partnerships to new technology designed to engage consumers in conservation. Learning from Mr. Rogers about how much energy will be needed in the future and how critical it is that we shave peak loads coupled nicely with Mr. Fedrizzi’s affirmation that LEED certification is on the rise both domestically and internationally, creating more energy efficient homes and buildings. When an audience member asked about government energy policies, Mr. Rogers demonstrated his unique leadership by encouraging industry to lead government instead of waiting on the government to set a minimum standard. This led into a discussion about Envision Charlotte and Duke Energy’s Smart Energy Now© program that is aiming to reduce downtown Charlotte’s commercial energy use by 20 percent in five years. Envision Charlotte is working to make Charlotte one of the most sustainable urban centers in the world and is an excellent example of successful public-private partnerships. The USGBC Charlotte Region Chapter is supporting Envision Charlotte and Smart Energy Now through an energy efficiency curriculum for existing building owners and facility managers. 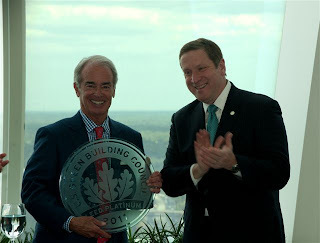 The program ended with Mr. Fedrizzi presenting to Mr. Rogers and the entire project team the LEED Platinum plaques for 21 floors inside the DEC that the company upfit under the Commercial Interiors rating system. The plaques serve as a symbol of Duke Energy’s commitment to environmental sustainability as a core tenet of their business strategy. The USGBC through its educational resources, chapter network and LEED rating system have provided businesses with the tools to incorporate sustainability into their management decisions, and both accomplishments were celebrated at the successful event.